Yesterday after hours S&P downgraded Spain by two notches and future market started selling off on this news. Spain 10 year yield opened above 6%. Once again ECB stepped in to bring the Spanish Yield below 6. Future market rallied on this news. Spain unemployment rate showed 24%. Just imagine with 25% of Spain population unemployed and with such huge debt, how can it pay back ? The much anticipated US GDP then showed weakness and it dropped from previous month 3% to 2.2 % while expectation was 2.5%. Consumer spending brought 2.9% of GDP which saved US Government from disgrace or else the US GDP would have come 1.5%. Consumer income showed 0.4% while consumer spending was 2.9%. This shows how credit card companies and retailer are making money. Is this going to create new credit crisis bubble ? Based on the weak GDP data stock market should have sold off but it just dropped 9 point and then it rallied up to 74 point and reached 4 year high because Mr Free Money Printing Manager Ben has assured he is there if the economy get worse. 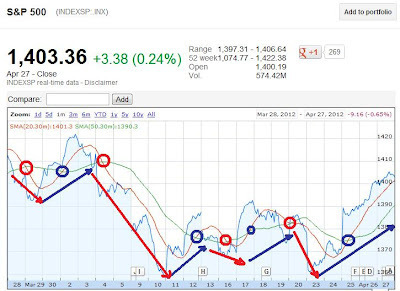 Its no Brainer that a bad news should lead to sell off and a good news should lead to rally. But in this crazy market its opposite. The issue with this kind of manipulative market is you never know a bad news is really bad news or whether it will rally or it will sell off. Its frustrating to see market rally on bad economic data, because oneday future market could open 200 point low and there would be no turning back, like it happened in 2008, 2009, 2010, 2011 and it takes over 6-9 month for such recovery. 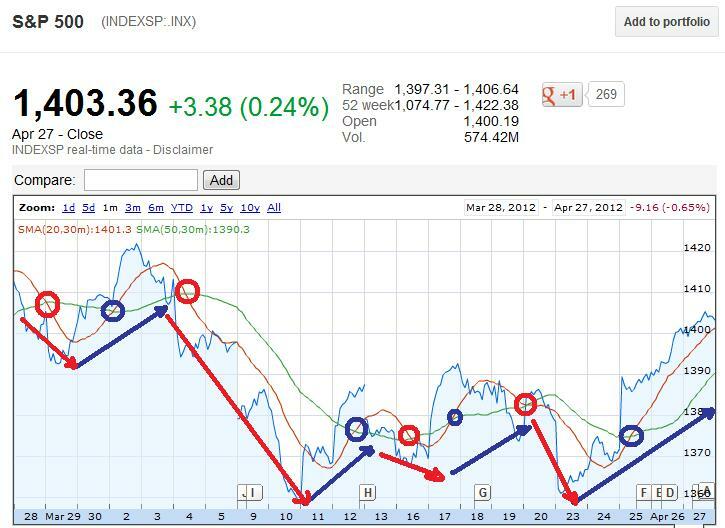 This kind of manipulative market only frustrates individual investor. The best way to tackle this kind of market is stop trading or simply follow the market, keep your emotion aside, and learn this unconventional, impractical, fraud method of making money. 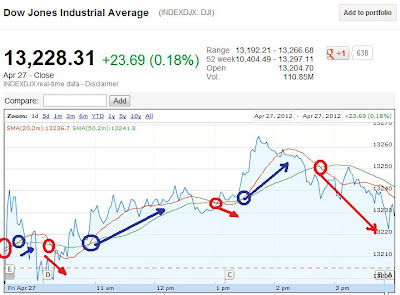 Just remember to sell off at the end of the day because you never know there could be good news next day and this market could sell off on the good economic data. 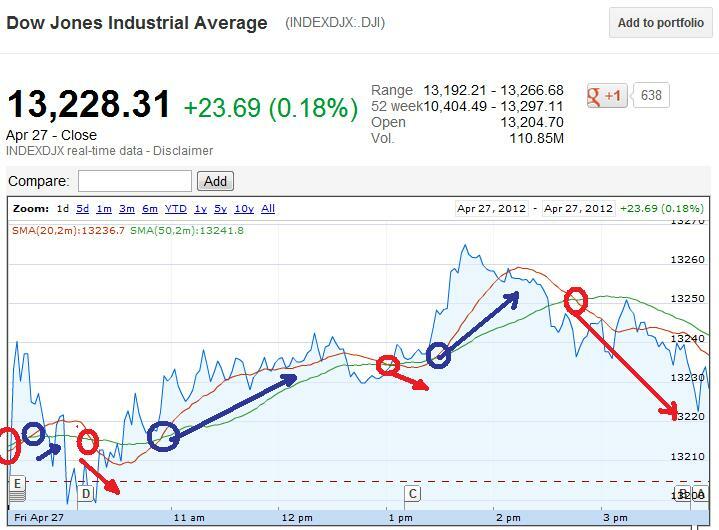 Dow was in bearish zone yesterday but bad GDP raised the hope for qe3 and market rallied on this bad news. At the close Dow is back to bearish zone zone, but once again it depends if futures is up or down. Ideally market should sell off on Monday but this is manipulated market. 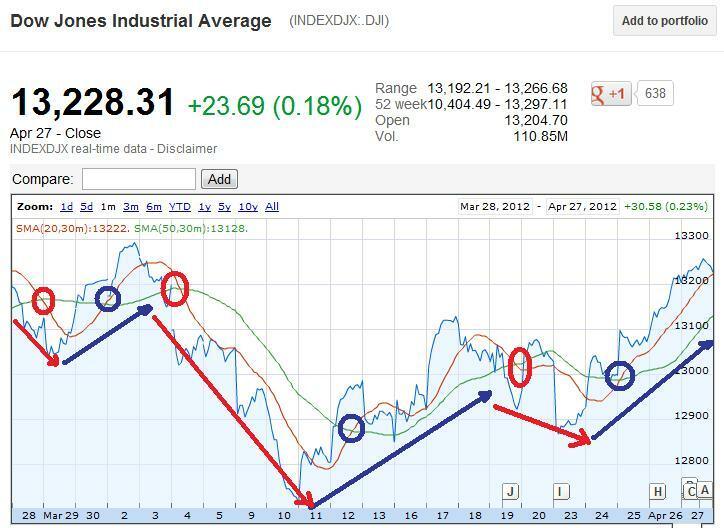 Dow 1 month chart is still bullish but if dow breaks 13120 then chart will be bearish again. 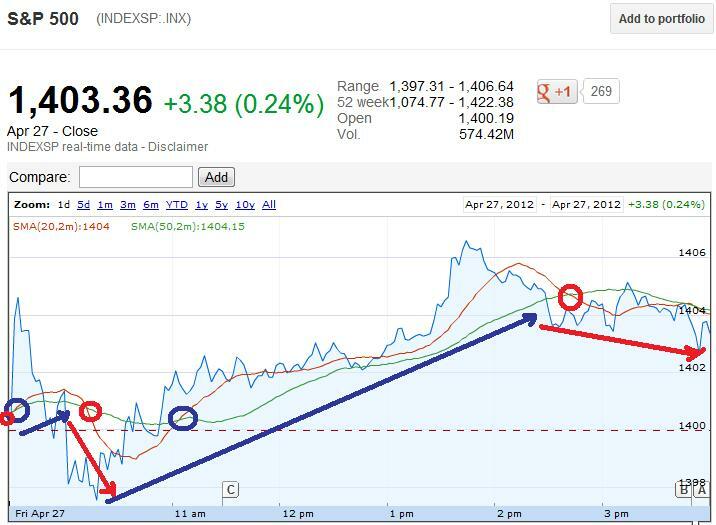 S&P500 was bearish yesterday at the close but bad gdp data changed everything and market rallied on this news. At the close S&P500 is back to bearish zone, and ideally S&P500 should sell off on Monday. 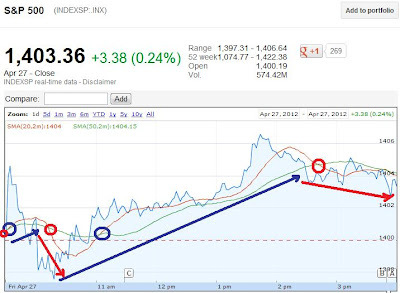 1 month chart of S&P500 is still bullish, S&P500 has to drop below 2390 to changed it to bearish zone again. For day trading watchout AMZN, SBUX, DECK, BIDU, AAPL, PCLN, MA, FAS, FAZ, TZA, TNA, TVIX, XIV, SVXY, UVXY (remember volatility is not a long term investment option use it for strictly day trading). Also Vix is in contango at the moment, so any rise in it would mean it will sell off by close and end up lower then initial rise in VIX.